Images are now resized. Since the example uses wallpaper-sized images, there’s no sense in not resizing them to go on a 44-pixel-tall table view cell. I’m using the popular image-resizing routines from Trevor’s Bike Shed to do the resizing with a nice interpolation quailty. Those resized images are now cached. I use an NSCache to store the images. 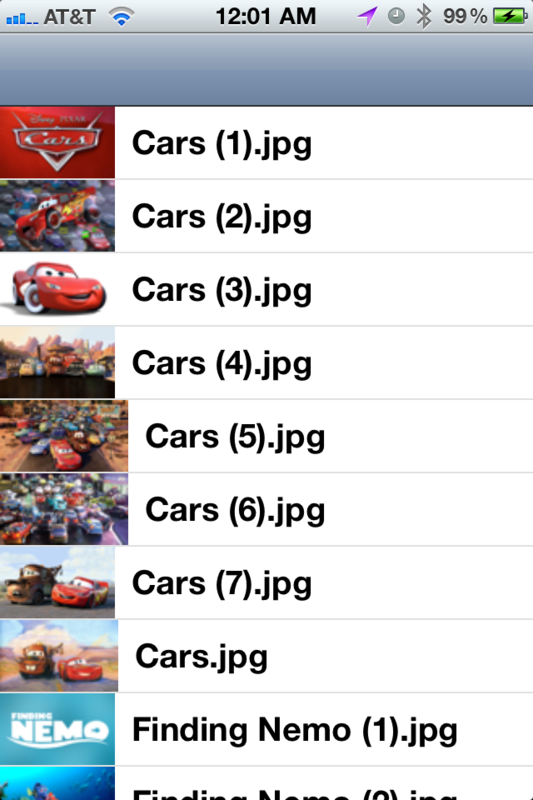 If the app receives a memory warning, it’ll jettison all of the cached images, but if you’re just scrolling up and down this is a quick and dirty way to cache the images. I had never really used NSCache before, so this was a good excuse to try it. I’m at CocoaConf in that state down to the South today, so this post has been brought to you by late-night hotel room caffeine. I made some other changes to the project to deal with a weird table view cell bug that I’ve submitted to Apple; a post on that is coming up next! Today I showed a couple of people at work a technique I use to do asynchronous URL loading in iOS, and the response on Twitter was great, so I’ve written it up for everybody. If you’re used to using ASIHTTPRequest or rolling your own NSURLConnection delegates, hopefully this method will be a breath of fresh air. The Problem: When you want to load something from the Internet, you don’t want to block your UI—especially when iOS might just kill your app for doing so—but writing delegate code is a pain. You have to remember which delegate methods get called in what order, to set yourself as the delegate (can’t tell you how many times that’s tripped me up), and handling multiple simultaneous connections with one delegate is… tricky, at best. We can easily do error checking after the NSURLConnection call; simply check to see if receivedData is nil, cast response to an NSHTTPURLRequest and check its statusCode property, and if all else fails, check out error. This is a quick example. It’s mainly designed to illustrate dispatch_async() as a wrapper for synchronous APIs. It isn’t good for multiple connections. You’ll want a custom dispatch queue for that. It doesn’t run on the main thread. If you’re updating your UI, you’ll need to do that on the main thread. Working with designers over the years, I’ve seen a few areas where the world of a designer and the world of a developer merge very well, and a few areas where they don’t. Photoshop comps that lead to sliced assets with non-localized text on them, storing a vertical gradient in a 1,024 × 1,024 JPEG image, Retina Display graphics that don’t match up to their non-Retina Display versions, and other places where I feel that a little bit of knowledge about iOS would go a long way. So, I’ve prepared this piece on what every designer should know before working with an iOS project. Literally. Since there’s no getting around this fact, we might as well start with it now. When your developer works with iOS, she’s using Apple’s tools to run on Apple’s operating system. So when she tells you that, for instance, a navigation bar can accept a tint color but not a custom gradient or an image, that’s because the Apple-provided version has those restrictions. Normally this isn’t an issue, but a designer needs to be prepared to provide their art in several different formats. For a tab bar, for instance, icons need to be (around) 30 × 30 pixels and filled out in the alpha channel. The Retina Display is not for layout. I think the best example of my last point above is the Retina Display. When it came out, developers started asking their designers for double-sized versions of their assets. Every image you provided for the original product needed to be resized. But the important thing to note about the Retina Display for a designer is not that suddenly there are two screen sizes to worry about on the iPhone. In fact, that can lead to catastrophe. When you design for the iPhone, you still create according to a 320 × 480 point screen. The Retina Display, unlike the regular display, happens to have two pixels per point. So when you make your assets, you have to design around the smaller size, but then take your assets and make a version exactly twice as large. This needs to be exact because the developer isn’t specifying the double-sized art or layout—in fact, they don’t specify anything. The art is simply named with an @2x suffix and iOS loads it in automatically. When the Retina Display came out, that was a big change for designers (and developers). Apple can do this at any time. Tomorrow morning, Apple could announce a new iPhone Nano with a smaller screen or an iPad Pro with a Retina Display screen. If the screen size changes beyond a certain threshold, then developers will need to re-work their applications’ UI to accomodate. If that happens, your developer will be asking you for new assets, and he’ll want them immediately. If you saved everything in Photoshop six months ago and forgot what exactly you did to style everything, it’s going to be a long week. That’s why I recommend working in vector art for all but the most photorealistic elements (like skeuomorphism). If your work is in vector art and the developer suddenly needs assets at 150% of the original size, you re-export as .PNG, send it to the developer, and go back to doing whatever it is designers do in their free time. iOS has very sophisticated drawing abilities. If you want the background of a certain UI element to have a gradient, you might generate that gradient at the size of the element, then send it to the developer. If you know that the gradient can be stretched horizontally, you might send a one-pixel-wide version of it, instead. But you can also just tell the developer, “Draw a gradient from this color to this color and use it here.” This applies to more advanced drawing as well—need a circle with a dark-blue fill at 80% opacity, stroked with a 3-point thick, white line? The developer can draw it in code. This has the advantage of working at any resolution and being extremely changeable. Decide tomorrow morning that you want the color of the circle a bit lighter? Instead of sending the developer a new image, send him a new color and have him draw it differently. I called this tip “push your developer” because not every developer is as comfortable as the next with more advanced drawing, but I firmly believe that the more drawing you can do in code, the better. Spend Time on the Icon. The app’s icon is the first thing a user sees when they’re browsing the App Store. A beautiful, well-conceived icon can do wonders for an app. There are plenty of resources online for iOS icon design, so if you’re not sure where to begin, just head to Google. The most successful iOS applications have a level of beauty to them that other apps just can’t match. Utilitarian layouts with spartan design work, and if your client is an enterprise looking for an internal app, are appropriate, but won’t help the app. Your goal should be to make the app successful because of your design, not in spite of it. Update: This post is getting some attention lately, so I’ve updated it a bit to be less incorrect. Sometimes when you’re debugging an application, especially one that you’ve inherited, you find yourself wondering when an object is released. Autorelease pools only compound the problem, delaying the actual release until the run loop is idle. In this post, I’ll show you how to take advantage of new features in the Objective-C runtime to run arbitrary code when any object—whether it’s your own or a part of Apple’s frameworks—is deallocated. OBJC_ASSOCIATION_ASSIGN No memory management; the value is simply assigned. OBJC_ASSOCIATION_RETAIN_NONATOMIC Retains the object non-atomically. OBJC_ASSOCIATION_COPY_NONATOMIC Copies the object non-atomically. OBJC_ASSOCIATION_RETAIN Retains the object atomically. OBJC_ASSOCIATION_COPY Copies the object atomically. Obviously, using OBJC_ASSOCIATION_ASSIGN won’t work for us, since it won’t cause the object to be retained. We also don’t want to use either of the copy policies, since we only want one copy of our objects around. For this example I’ll be using OBJC_ASSOCIATION_RETAIN, but not over OBJC_ASSOCIATION_RETAIN_NONATOMIC for any compelling reason. Using the __block storage qualifier on an Objective-C object causes the runtime to avoid retaining the object, since the dymanics of object retain counts inside of blocks would be far too hairy to manage automatically. Seriously, though: don’t do it unless you absolutely must. So there you have it: a quick and dirty category on NSObject to run arbitrary code at deallocation. I don’t really see a use it for it in production code, but on those occasions when you’re debugging someone else’s memory management, this could be handy. Since it uses blocks and associated objects, you’ll need to be running Mac OS X Snow Leopard (64-bit) or later or iOS 4.0 or later. Using Core Data? You can’t share access to an NSManagedObjectContext across multiple threads, dispatch queues, or NSOperation queues, so for each one you’ll need to create a new instance. Similarly, don’t pass an NSManagedObject or subclass thereof between threads. Give each of your objects a unique ID—CFUUID works well for this—and pass the ID around, pulling a new object out of your NSManagedObjectContext for each thread. It’s a pain, but that’s how to (safely) get around threading and Core Data. Use Grand Central Dispatch. Using dispatch_get_main_queue(), you can get a reference to the main queue and submit blocks to it for updating your UI. This is typically a clean, easy way to refactor existing code for thread-aware programming. Use -performSelectorOnMainThread:withObject:waitUntilDone: and friends. This has the drawback of only working for methods that take one or zero Objective-C objects as arguments, but can be a quick and easy way to use fire-and-forget methods like -reloadData on UITableView. Think about how you declare your properties. How many people have been using atomic properties? Before now, not many. In fact, before now, it was typically useless, as the chances of something interrupting your accessor methods was pretty low. Now, though, if you’re planning on accessing an object from multiple threads, you really need to control access to your properties. Use locks. Locks, long the scourge of the multithreaded-code author, are simply essential for some parts of multithreaded programming. Whether you’re using NSLock or a lower-level lock, or even something like Grand Central Dispatch’s counting semaphore type, dispatch_semaphore_t, protect critical regions of your code from multiple accessors with (carefully-thought-out) locked access. This list is by no means exhaustive, and Apple can do a lot to make this irrelevant (such as make UIKit threadsafe, which would be a killer iOS 5.0 feature), but with the iPad 2’s arrival, developers can no longer assume safety from threading problems. Be sure also to read Apple’s Threading Programming Guide to get anything I’ve left out. It also makes a great excuse to buy an iPad 2. I mean, you need to test this, right?